People with bipolar disorder, previously known as manic-depressive illness, usually experience episodes of deep depression and manic highs. Many patients return to normal moods in between acute episodes, but a large number continue to have troubling symptoms, usually of depression. They also have an increased risk of suicide. The depressive episodes are indistinguishable from those of a major depression and are characterized by sad mood, loss of interest, lack of energy, disturbances of sleep and appetite, difficulty concentrating, feelings of hopelessness and worthlessness, suicidal thoughts, and sometimes suicidal acts. Symptoms of mania include increased energy, decreased need for sleep, a marked interest in goal-directed activities, and poor judgment. For example, during manic episodes, individuals may spend excessively or engage in uncharacteristic drug abuse or sexual behaviors. Individuals with mania may be euphoric, but some are predominantly irritable. Typically, manic individuals are grandiose, and when the mania is particularly severe, they may have delusions or hallucinations. In such instances, patients may believe that they are prophets, deities, or on a special mission. Sometimes, too, mania can be mild. Then it is called hypomania. Bipolar disorder that is characterized by full manic episodes and depressions affects about 1 percent of the population worldwide. When people who suffer from hypomania along with depressions are factored in, the prevalence goes up to 2.6 percent. This finding is based on a study of Americans over the age of 18. In addition, about the same number of men and women suffer from bipolar disorder. People with this disorder typically have recurrences of acute mania or depression throughout their lives. 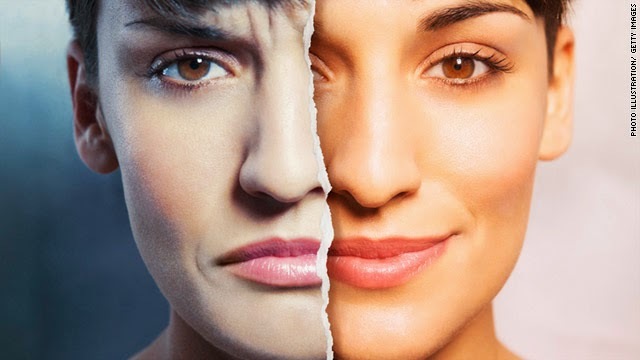 Bipolar disorder is highly influenced by genes. In fact, many different genes contribute to the risk of the disorder. Modern technology has allowed us to identify a small number of these genes. The study of the genetic basis of bipolar disorder continues to be a very active area of research. Individuals with this disorder can benefit from a broad array of treatments. One of these is lithium. During the late 1940s, researchers showed that when guinea pigs were injected with lithium, they became placid, implying that the lithium had a mood-stabilizing effect. When given to manic patients, lithium improved all manic symptoms and stabilized their moods. This enabled people with the disorder to return to work and live relatively normal lives. Although lithium is quite effective, many patients require additional treatments, especially for their depression. Other medications with mood-stabilizing effects used to treat bipolar disorder include some drugs, such as valproate, that were first developed as anticonvulsants. None of the existing drugs are perfect, and they all have side effects. As a result, additional research on bipolar disorder and its treatment continues to be an important priority.